Kelsey Weigel won first place for her work that focused on finding a novel role for carcinoma-associated fibroblasts (CAFs) in blocking anoikis, detachment-induced cell death, in multiple cell lines. She found that CAFs secrete elevated quantities of insulin-like growth factor-binding proteins (IGFBPs) that are both necessary for CAF-mediated anoikis inhibition and sufficient to block anoikis in the absence of CAFs. These results identifies IGFBPs as potential targets for the development of novel chemotherapeutics designed to eliminate detached cancer cells. Cassandra Buchheit earned an honorable mention for her project that has focused specifically on a rare, highly aggressive type of breast cancer called inflammatory breast cancer (IBC). She discussed a novel mechanism by which IBC cells resist cell death when they become detached from the extracellular matrix, which happens during metastasis. Raju Rayavarapu also earned an honorable mention for his project studying the role of cell-cell contacts in the survival of extracellular matrix (ECM) detached mammary epithelial cells. His data suggest that oncogenic signaling through ErbB2 promotes the formation of cellular aggregates that function to prevent EGFR from degradation and subsequently to block the induction of anoikis. Rayavarapu also earned an honorable mention at the 2012 Cancer Research Day. Weigel, Buchheit, and Rayavrapu are all graduate students in the laboratory of Zachary Schafer, Coleman Assistant Professor of Cancer Biology. Jeff Johnson earned an honorable mention for his research on oral squamous cell carcinoma. The serine protease kallikrein-related peptidase 5 (KLK5) and its inhibitor LEKTI are dysregulated in oral pre-malignancy and oral cancer. His work showed evidence that dysregulated KLK5 cleaves desmoglein-1 (Dsg-1) resulting in dissolution of desmosomes leading to increased mobility of cancer cells and contributing to metastasis. Johnson is a senior scientist in the laboratory of Sharon Stack, Ann F. Dunne & Elizabeth Riley Director of the Harper Cancer Research Institute. 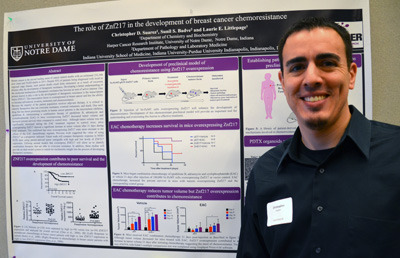 Christopher Suarez won first place for his research on the role of the ZNF217 transcription factor protein in the development of breast cancer chemoresistance. Increased expression of ZNF217 is a poor prognostic indicator for breast cancer patients and contributes to reduced survival, increased metastasis, and reduced response to therapy. His research focused on examining therapeutic regimens that overcome metastasis, resistance, and death. Suarez is a post-doc in the lab of Laurie Littlepage, Campbell Family Assistant Professor of Cancer Research. Sunny Shah, a post-doctoral fellow in the lab of Hsueh-Chia Chang, the Bayer Corporation Professor of Engineering, earned an honorable mention for his work related to the detection of microRNA biomarkers associated with oral cancer. The goal of his research is to develop a push-button, early-screening diagnostic platform using a microfluidics-based integrated platform that can extract, concentrate and detect diagnostic biomarkers. 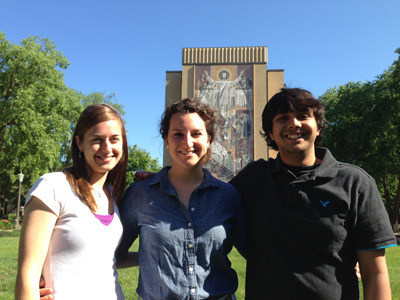 Originally published by Stephanie Healey at science.nd.edu on June 03, 2014.